Extra Bumpup of 1500.Extra Bumpup of 1500. 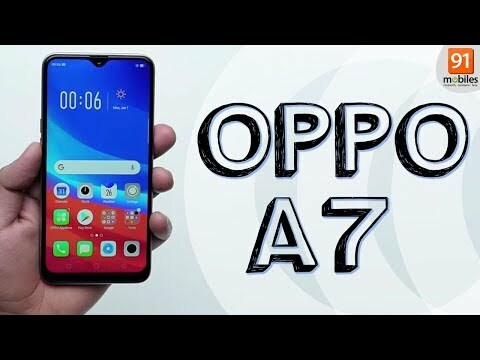 Oppo A7 is a flagship killer at this price range.This phone literally everything from a bezel less display with a waterdrop notch to a stunning camera which click very amazing portraits plus unlike other oppo&apos;s phone it has a snapdragon processor which makes sure that the phone never lags so overall it is a great phone. Oppo A7 is hilariously overpriced.This phone doesn&apos;t have anything which justifies the cost the performance of the phone is average you are not able to play PUBG at medium settings because it hangs a lot , then the camera is also average as in click just OK pictures and the battery backup is also not so great so personally i wont recommend this to anyone . A beautiful phone with triangular notch and small chin. This phone is a complete budget friendly looker! A superior looks are complimented by pretty good hardware and this sure makes the phone super value for money. Totally go for it! This phone is built beautifully the screen looks very amazing and materialistic with the classy teardrop notch and bezzel less display.Camera is above average.This phone seriously lacks in processing power as it has an very outdated processor but it can handle normal usage like a piece of cake.Battery backup is good.Overall its a good phone but can&apos;t handle much load. Although after using it, I thought the performance is not worth the price, but still the build and the waterdrop notch has made it look really good. The cameras and battery are amazing as always in Oppo phones. Kinda overpriced maybe. • Overpriced for the performance it offers. I never suggest any Oppo phone to anyone but this one is an exception here. I liked it very much in my 7 days usage. Had to give it to my mother, she loved the design. Oppo is really improving. I liked the cameras, design, performance and heck even battery life. This device is a good overall package if you can ignore the company and it&apos;s terrible UI. 6 Pricebaba users have written their experience with Oppo A7. If you own Oppo A7, please do leave your feedback too. Lowest price of Oppo A7 price in India starts at Rs. 15,990 Oppo A7 is available on Flipkart at Rs. 15,990. Prices updated on 25th April 2019. The Oppo A7 is the newest phone in the A-series. The Oppo A7 has a small notch that does not take up too much space and in-turn gives the phone a clean look. The plastic body has a matte finish and a laminated back panel which is textured. The phone weighs 168 grams. The 6.4-inch HD+ display has a resolution of 1520 x 720 pixels. The waterdrop notch results in the lack of a notification LED. The Oppo A7 has a 13-megapixel primary camera with f/2.2 aperture and a second camera with a 2-megapixel sensor. Autofocus is slow since there is no PDAF. The front camera od 16 megapixels is quite average and does not support low light photography. The processor of the Oppo phone is the Qualcomm Snapdragon 450 which isn’t too powerful. The phone comes with 4GB RAM and an internal memory of 64 GB. The operating system is the Android 8.1 Oreo. Its battery power is 4230 mAh and is the Li-Ion type. The SIM tray can accommodate two Nano SIMs and a micro-SD card. The dual-SIM phone supports 3G and 4G. Other connectivity options include Bluetooth 4.2, Wi-fi, USB, FM radio.